Yesterday, Robert Rose and I held a workshop at Openview Venture Partners‘ headquarters in Boston. The workshop was based on our new book, Managing Content Marketing. The most compelling part of the workshop (at least according to the participants) was the topic of developing a content marketing team within the marketing department. Here’s some of what we covered. To deliver on these stages, there are a variety of roles that need to be filled within the marketing organization. For Junta42 and the Content Marketing Institute (CMI), that role is filled by me. Eloqua has Joe Chernov, whose title is VP of Content Marketing. Monetate has Rob Yoegel, their new Content Marketing Director. Even Cisco has a content evangelist. Perhaps the most critical role in the process is held by the managing editor. This role needs to have professional writing (storytelling) experience. The managing editor is the actual day-to-day storyteller for the organization. The managing editor makes the content compelling. But, it’s worth noting that they are not always the “source” of the content, which may be the CEO, the engineers or even product development managers. This role may also be outsourced. Michele Linn serves as the managing editor for CMI, and has the title of content development director. These are your sources…your content well. They may be writers, but in many cases are not. These are the sources in and around the company that need to be mined for content. They are the source of material for our story – not necessarily the story itself. All companies already have a wealth of resources for content creation (including our customers). We just need to use them wisely. The content producers are the ones that make the content beautiful. It compels the audience to engage in the content. This could be one person, an in-house design team, or even a digital agency in larger organizations. Very often this role is outsourced – especially for different media (e.g. video/audio/multimedia/mobile app). For CMI, Joseph Kalinowski, our Marketing and Creative Director, serves as our content producer. Remember – the story is generating conversation. 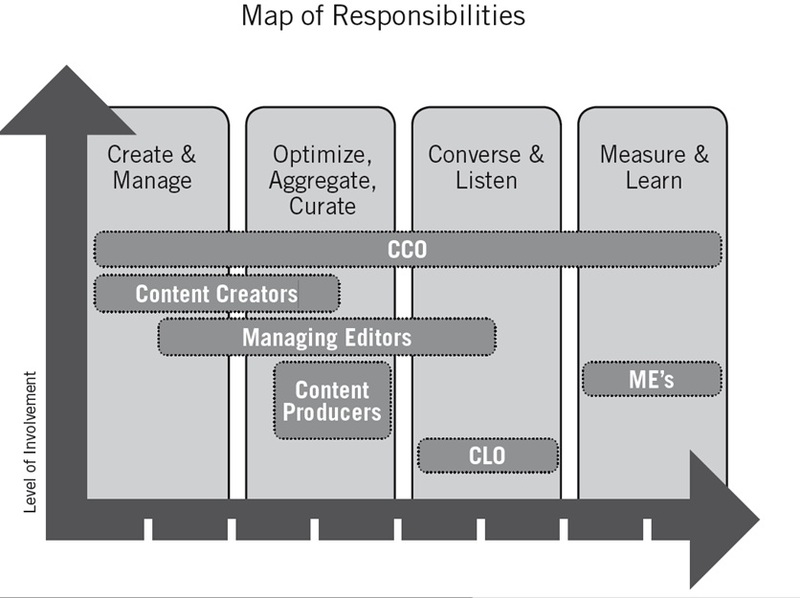 The CLO is the “air-traffic control” for your social media and other content channels. They are there to listen to the groups of customers, prospects, influencers and competitors. They often maintain the conversation, but also route conversation to the appropriate content resource (hence the air-traffic control title). The CLO either establishes the “listening posts” or, at minimum, monitors these channels as directed by the CCO. Pam Kozelka, CMI’s VP of Operations, holds this role for our organization. Remember, there is no silver bullet. 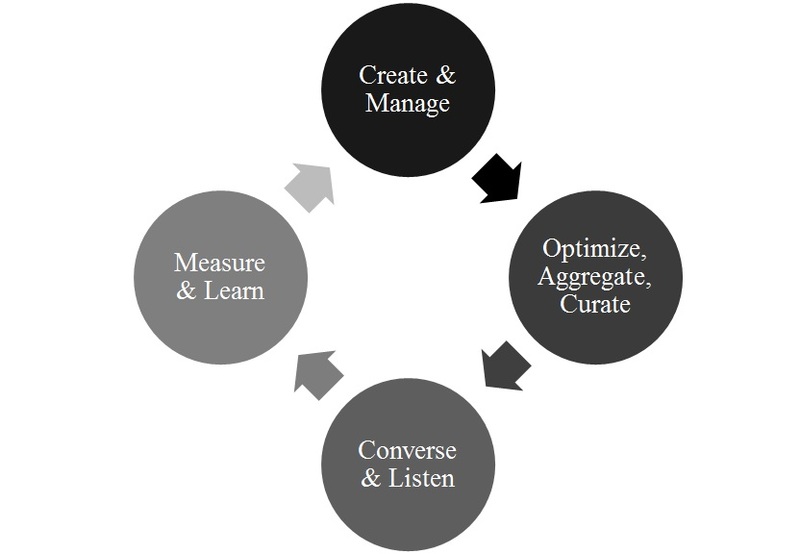 Content marketing success can happen differently in every company of every size. Match the roles needed with the skill sets you have and outsource what you need. For more detail on this entire process, as well as building the organizational structure, Managing Content Marketing is a fantastic resource – Available now on Amazon, Barnes & Noble and other fine online retail establishments.